The meeting opened with a moment of silence for Barbara Post. Her memorial is Saturday, Oct. 2nd at West End Presbyterian Church, 105th St. & Amsterdam at 4 PM. Then we moved on to . . .
Roundly defeated with lots of tenant help: Pedro Espada, State Senate Majority Leader and current head of the State Senate's housing committee. "Espada did more to kill attempts to strengthen New York State's rent regulations than anyone in Albany. His move came the day before his committee was scheduled to vote on a bill to repeal the 1997 deregulation of vacant apartments that rented for more than $2,000 a month, the tenant movement's main demand of the Democrats. Naturally, he later received a few hundred thousand dollars in contributions from the real estate lobby. He may well be indicted for corruption now that he's out of office, as he is under investigation for allegedly filching funds from health clinics he owns for personal and political gain." One of the laws that Espada refused to let out of committee this past legislative session would have repealed vacancy decontrol. That would have put many market-rate apartments in this building back into rent stabilization. Gustavo Rivera, the victor in the "Espada" race in the Bronx, said in his victory night speech, "We asked you to imagine a community where tenants won't have to fear homelessness because their rent laws are being written by wealthy landlords." Executive Committee member Steve Koulish volunteered as a poll watcher in the Espada/Rivera race in the Bronx, and reported on the importance of individual participation and on the general exhilaration when Espada lost by 2-to-1 . Other primary victors for our neighborhood included Eric Schneiderman, an Upper West Side progressive for Attorney General; State Senator Bill Perkins - who has tirelessly championed our tenant bills; and Congressman Charles Rangel. DHCR ruled on both sides' Petitions for Administrative Review (PARs), and kept things as originally decided: Tenants whose appliance surcharges under Mitchell-Lama became part of their rent stabilized rents would have those rolled back and get lump sum repayments going back to when submetering started in March 2008. Stellar would not be charged triple damages. Stellar has until about Nov. 2, 2010 to appeal that decision to a state court - but bears a heavy legal burden of showing that DHCR's decisions in our favor were "arbitrary or capricious." That kind of case (appealing from a state agency's decision) is called an "Article 78 proceeding." Stellar would be opposing DHCR in that case. In the meantime, tenants who participated in the suit may keep paying the Legal Regulated Rent ordered by DHCR with a separate check for the electric bill. Tenants who have NOT yet participated in the suit but who did have appliance surcharges added to their rent stabilized rents should contact Sue, Steve, or Greg to file their own complaints now. There's still time! If you get a lease renewal that ignores the Legal Regulated Rent, please send Stellar a letter with the signed lease renewal that states, "Kindly revise the lease renewal in keeping with the Legal Regulated Rent ordered by DHCR." Make a copy of the lease renewal and your letter and send the originals to Stellar by certified mail, return receipt requested. Our attorney has advised Stellar that if it sends a letter to any tenant here for failing to pay the difference between the Legal Regulated Rent and the higher rent Stellar has been charging, we will take legal action. If you get such a letter from Stellar, let Sue know IMMEDIATELY. And send Stellar a letter (click here and fill in the blanks). The escrow account with DHCR's list of work to be done covers the boiler replacement and façade repairs. DHCR's regulations say "None of the corrective work performed pursuant [to that list] shall qualify for an increase in rent" - so even if the cost exceeded what was in the DHCR list, it should not be the basis for an MCI. Submetering is NOT a major capital improvement since DHCR gives owners a financial incentive to submeter and tenants do not benefit. The application does not specify exactly what work was done. 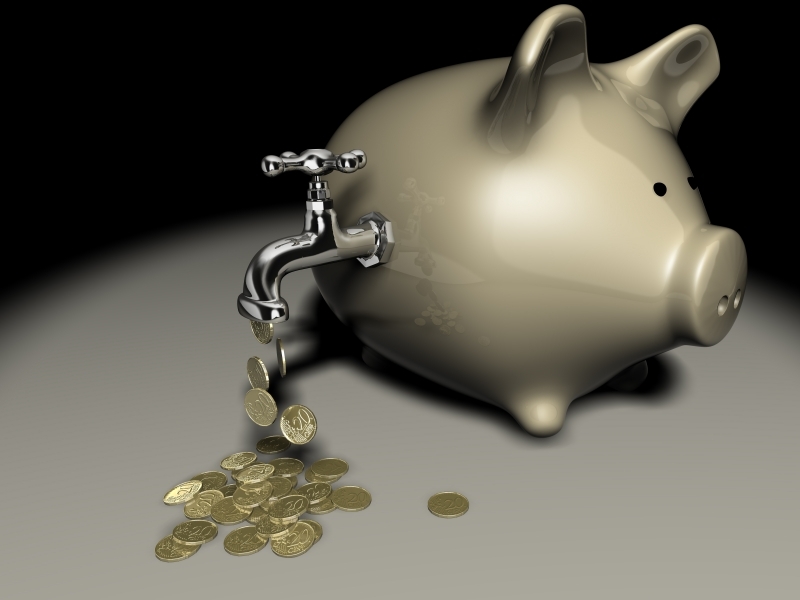 The application does not allocate costs to commercial and professional tenants. The application is internally inconsistent (for example, it says the cost will be $20.72 a room in one place, and $18.30 per room in another). We can expected a long legal battle - and we need funds to fight it, so please contribute to our legal fund if you have not already (or even if you have!). This will affect rent stabilized tenants except those on SCRIE or DRIE. No more than 6% of your current rent could be added to your rent each year, no matter how high the MCI is. Your current rent is $500/month. 1% of $500 is $5, so 6% = $30. So this year, no more than $30 per month could be added to your rent. Your next year's rent is now $530. You get a lease renewal of, say, 3%. That is 3% of $530. That comes to $545.90. To determine how much of the MCI can be added to your rent, add 6% of $545.90, bringing your rent to $578.64. That would continue to increase, 6% each year, until the entire amount owed is paid. Then it would level off. Unless the law changes, the MCI is never rolled back or taken off your rent once it is added. Now we wait for the owner's response and then DHCR's decision. Our treasurer, Joan Browne, gave the financial report. Money is coming in, but so are our legal bills for the MCI and for the submetering case. Please contribute at least $100 per apartment - or more if you can spare it. THE SIDE DOORS: The Executive Committee met with building manager Lu Pedraza about security issues. Stellar is proposing to install new locks on the side doors (same lock for both) with keys that cannot be reproduced. Tenants who qualify would deposit $25 (the cost of the key). After extensive discussion and a vote about our recommendations to Stellar, the sense of the meeting was that keys should be available to seniors (65 and over) and those who are proven disabled. Proof of disability would include government documents like a reduced fare bus pass for age or disability, an Access-a-Ride card, documentation of disability from Social Security or the Veterans Administration, or a letter from your doctor. THE FRONT DOORS AND INTERCOM: At the meeting with Lu Pedraza, we stressed that the front doors are often unlocked and the doormen seem to be letting in anyone, including delivery people, without using the intercom. Sometimes the doormen are not at their station or are asleep. To deal with this, tenants who are concerned must note the DATE and TIME of the problem and let the building manager know. Lu Pedraza, lpedraza@stellarmangement.com and his assistant Basil Chapman, bchapman@stellarmanagement.com, are at 212-222-4430, and their office is at 70 W. 93rd Street on the ground floor. when construction or moving is going on, either a building staff person should be at the side door that is held open, or all the moving or equipment should be put in position so the side door need only be open for a short while. BEDBUGS - There have been three reported cases in this building. Stellar wants to nip this in the bud (or the bug), so it will send an inspector if you have seen what you think is a bedbug in your apartment. Let Lu Pedraza or Basil Chapman know. If bedbugs are found, Stellar will send a special exterminator (not the regular one for mice) and will pay for the extermination, which takes at least two visits and over a week. During that time you will have to bag all of your clothing and other fabrics, and clean them in a prescribed way. To read more about what they are (they bite but do not spread disease) and how to get rid of them, click here for a NYC Health Department guide. Rich people, poor people, clean people, dirty people, five-star hotels, and Abercrombie & Fitch have had bedbugs. There is no stigma, and you can get it by sitting in a seat at the opera. But they spread fast - so tell Stellar early. notify neighbors, including above and below, that an apartment near them (without giving specifics) has bedbugs, and ask them to let Stellar inspect. Please make your apartment available so we don't have an epidemic. MICE - If you have seen a mouse (or any other critter) in your apartment, write it in the requisition slip at the doorman's desk. Stellar will send Exterminator # 1 who will put down peanut-butter-scented glue traps. If they don't help and you see another mouse, write it in the requisition slip at the doorman's desk and Stellar will send Exterminator #2 who will move out all your appliances and seal the holes in the wall, including where your phone lines come in, the stove gas pipe, etc. The exterminators come every other Wednesday at 8 AM and the alternate-week Saturdays at 10 AM. To ensure that they actually get to your apartment, do notify the doorman in advance that you are expecting the exterminator. If the exterminator fails to show up when scheduled, notify Lu Pedraza and Basil Chapman. The rules include that the tenant who has rented it should be present and responsible for what goes on, and that the noise level should be kept down. Please be considerate of your neighbors who live above and indeed all the apartments facing the back of the building. Sound carries! 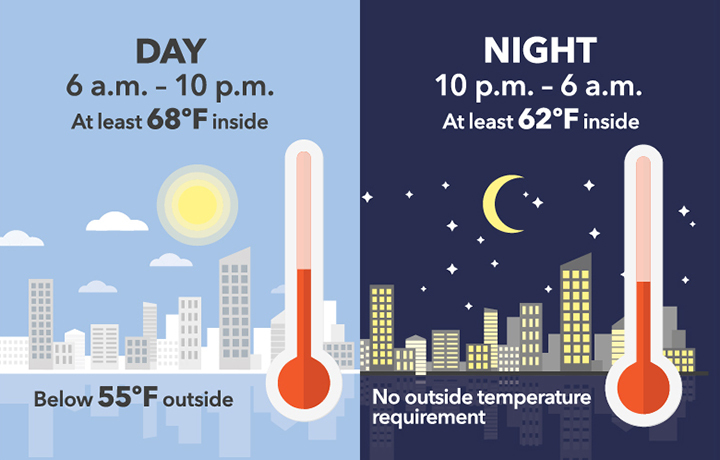 6 AM to 10 PM: When the temperature outside is 55° or colder, the temperature inside must be at least 68°. 10 PM to 6 AM: When the temperature outside is 40° or colder, the temperature inside must be at least 55°. Ruth Ellin has proposed changing the law to raise the minimum heat levels. Tenants interested in working with her should contact the Executive Committee. $25 per apartment for the first year, and $10 per apartment thereafter.